Aldiss propone, en una serie de relatos cortos, una historia de la humanidad que abarca millones de años, desde nuestras estúpidas guerras en la Tierra hasta la inevitable decadencia de nuestra querida galaxia. Cada relato toca un tema específico en la historia de la humanidad; algunos de estos relatos son bastante buenos mientras que otros se quedan un poco cortos pero sin llegar a ser malos. Para mí el mejor relato ha sido el último: Los milenios finales.Tiene algunos de mis temas favoritos como, por ejemplo, robots, civilizaciones extraterrestres y colonización de planetas. Este libro tiene un poco de todo y lo que más me sorprendió fue su gigantesca línea de tiempo (comparada con otros libros que he leído este año como los de Scalzi o James S.A. Corey).Me imagino a Aldiss escribiendo este libro con el ceño fruncido, víctima de la preocupación por nuestro futuro, por el futuro de la humanidad. A reflexionar. Curiosamente este libro, al igual que el que leí inmediatamente antes (334), consta de varios relatos entrelazados que forman una historia más compleja sobre el futuro de la humanidad.En el caso del libro de Aldiss, la trama es lineal, desde un futuro cercano hasta el fin de nuestra galaxia. Está lleno de ideas originales que valdría la pena explorar en relatos más largos.Las 3 estrellas son porque los relatos son de calidad e interés muy desparejos, aunque el libro es corto y las viñetas individualmente no son largas, algunos relatos me parecieron somníferos en comparación con otros. Mis favoritos: el de los robots, el del ser mutante, y el relato final.Me queda la duda, al pensar en el futuro de nuestra especie, si ser o no optimista. Sin duda este libro plantea posibilidades en uno y otro sentido. My second read by Aldiss and just as enjoyable. This is from the golden age of scifi or thereabout, 9 thematically connected stories about the future of the Earth. Of course that is much too vague, since most if not all science fiction deals with that very subject, but this is specifically the projected future that spans millennia and then some. So it's a very lofty, very ambitious premise and the execution, while somewhat uneven, is quite good too. Not great, mind you, for me it never really exceeds the terrific first story, but very interesting still. Aldiss gives himself 40 million years to play with and each story visits pivotal moments in that timeline, the highs and lows and various oscillations in between. It's wildly inventive and often has a moral, but then again can just be read as an entertaining tale. Originally published in 1959 in UK under The Canopy of Time and 1960 in USA under author's preferred title seen above, it doesn't really reflect its age with the sort of dated references some genre books from that era tend to. This is pure imagination shaped by a good grasp of historical references, social psychology and politics. Despite all the serious implications such a collection might have found itself weighted down with, this is still pretty light reading, mostly entertaining, though might make you think now and again. Not sure if it was ever meant to be more, it's quite slender and unimposing for all that it is. Fun read. Recommended for science fiction fans. 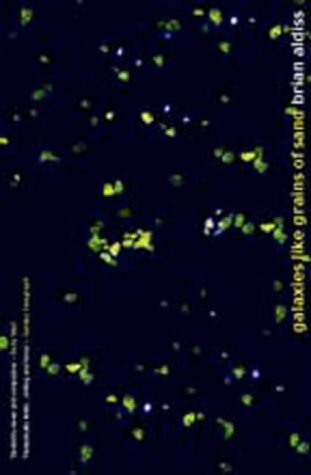 Galaxies Like Grains of Sandis a solid work of science fiction. It accomplishes what so many books in the genre surprisingly fail to do, which is to raise questions about our collective future based upon our past and present conditions. For those that want to consider far reaching ideas about our long-term societal and human evolutionary paths, Galaxies Like Grains of Sandhas no shortage of such ideas.My issues with Galaxies stem from its structure. It attempts to be one complete text that presents fragments of Earth's history through countless millennia into the future. To accomplish this structure, the book is comprised of several short stories that are tied together with brief prefaces that focus on the book's historical theme.Aldiss' approach fragments the characters and the setting of each story while the central them of Earth's history is carried through to the end. Consequently, the characters and settings of each story serve Aldiss' purpose, but they fail to elicit any lasting sympathy. The characters simply vanish as the next fragment begins.The end result feels more like a recital of Aldiss' version of Revelation, and the human implications associated with Aldiss' visions are left to a sort of faith in him as the all-knowing writer. In the absence of sympathy, there is no way to feel a sense of truth in Aldiss' words.I think science fiction is capable of a literary story; complete with characters that communicate the nature of their existence, a setting that extrapolates realistic speculations on science, and a plot that strikes close to a human understanding of life. But so far, such a book has been elusive. This is easily one of the best sci-fi novel, or just book, that I have ever read. This book is old and I had to obtain my copy via eBay, but it was worth it. The eight interconnected stories come to a surprising conclusion, and overall is very thought-provoking. I liked how each chapter focused on a different part in human history. While I do feel that this book could have used some more detail (the book is fairly slim compared to other books such as say, Dune) it is still a wonderful and thought-provoking read, with some juicy nugget of philosophy or thought in each section. My favorites were the 'Mutant' and the 'Ultimate' Millennia chapters. Visionary history of mankind as told in nine installments by its replacement. Tells the tale like a geologist would - using million, thousand, and hundred year increments - Aldiss shows how man is the perfect seedling for populating the universe as well as the ultimate vehicle for its self-destruction. Man ruins the Earth, leaves Earth for the stars, tackles the problems of time travel through an integrated form of speech-like alchemy, rediscovers a still populated Earth but does not believe it to be the Earth of myth, renames Earth as there are already hundreds of planets in the universe laying claim to that distinction, unifies the universe, institutes galactic warfare as a necessary economical device, and destroys the universe in a truly unique battle against man's successor. Time is the constant, and Aldiss makes us aware that we are just a silly soap opera for the infinite to enjoy for but a minute or two. A collection of short stories that Aldiss wrote many years ago, recompiled and republished recently. The stories stitch together the future history of mankind from the near future through to the galaxy's demise due to a form of proton decay. It is quaintly anachronistic, referring to 'reels' of holographic 3-D cinematography, intelligent machines communicating their digital information to each other by punch card, and using the term 'island universe' for the Milky Way galaxy--a term that fell out of favor in the first half of the 20th century.Yet most of the stories themselves remain imaginative and fresh for this new generation audience. Aldiss' distinctive world-view (and the primary mode of human space travel he depicts) incorporates and heavily depends on elements of eastern religious mysticism. This is sure to irk hard sci-fi fans - there is no attempt to extrapolate these imagined 'technologies' from known science concepts. I think this is Aldiss' attempt to foresee what cannot be foreseen, and so I find it a laudable enterprise. I'm not averse to finding spiritual elements in my imagined future worlds, so I enjoyed this, but I would not choose to call this science fiction. For me, it crosses the threshold into fantasy.A few of the stories suffer from a disease started by Isaac Asimov - I call it 'board-room-itis', a malady whose symptoms are the desire to write about people sitting about facing one another in a board room discussing the action and its futuristic settings rather than boldly venturing out into the rich, colorfully envisioned world itself and showing it to the reader first-hand.I believe Aldiss may have been the first to explore the demise of the universe as we know it. At a time when most science fiction writers were content with envisioning events of the next few tens of thousands of years, Aldiss was seeking the end-game. For this alone, I believe 'Galaxies like Grains of Sand' is a worthwhile read. This is from my Dad's collection. Before I get to the substance of the book, I think it's worth mentioning that my Dad's copy is from 1960 and it has a cigarette ad right in the middle of the book. Wow. Anyway, the novel is about the history of the Earth and our Galaxy in the very distant future. It reminds me a lot of Cloud Atlas, even though it was written so long before Cloud Atlas. I enjoyed it a great deal, and the story felt cohesive though I just noticed when examining the book that many of the chapters were published as short stories before being combined into novel form. Because of this short story format, and because the the story spans millions of years, there isn't a central character, but many small under-developed characters. The story is more central than the characters. The book is a collection of short stories published in the pulps between 1957-1958. Aldiss has added some new interstitial material to connect the stories by way of describing them as historical fragments of life in the Milky Way galaxy. Most of the stories are merely average at best. Only two managed to hold my interest: Who Can Replace a Man?, about robots who do their best to carry on after the last human dies, and Visiting Amoeba, about the newest lifeform in a nearby galaxy stopping in to say goodbye to mankind, the most advanced lifeform in the dying Milky Way galaxy. Visiting Amoeba is also the origin of the title phrase "Galaxies Like Grains of Sand" and is probably the strongest story in the book. Worth a read if you come across it but not worth seeking out.